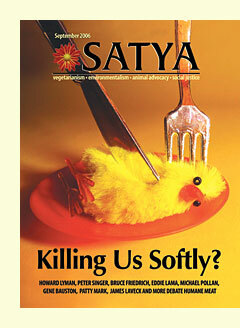 A social justice cause falls prey to the doctrine of "necessary evil"
Satya Magazine, titled Killing Us Softly? Debating Humane Meat. Click here to read the magazine's editorial. Printable version of this essay (including editorial) here. Last fall, an intelligent, socially conscious, and compassionate person told me that after seeing a Tribe of Heart documentary at a local film festival, she had made a commitment not to participate in animal cruelty anymore. From now on she would only purchase "happy meat" at Whole Foods Market. Something about these words, offered with sincere appreciation for the work I do as an activist filmmaker, was deeply troubling. I knew they were part of a trend I'd been seeing build amongst audiences over the last few months. The same films that had once inspired large numbers of people to completely reconsider their participation in the exploitation of animals were now triggering something new, an enthusiasm for the moral advantages of "humane" meat. I began to think about how this had come to be, and why the implications seemed to loom so large. Eerily, the first thing that floated into my mind was George Orwell's book 1984, with its depiction of a gloomy world in which nameless bureaucrats would daily redefine the meanings of words in the dictionary as a means of controlling the thoughts of the masses. "Doublethink," said Orwell, "means the power of holding two contradictory beliefs in one's mind simultaneously, and accepting both of them." with which we could be induced to take part in our own undoing. In the midst of this disquieting interlude, I was lucky enough to share a meal with John Stauber, co-author of Toxic Sludge is Good for You: Lies, Damn Lies, and the Public Relations Industry. "This has all happened before," said John, after patiently listening to my tale of woe. 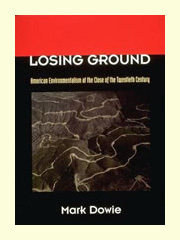 "Read Losing Ground: American Environmentalism at the Close of the 20th Century by Mark Dowie." So I did, and the plot thickened. What was bothering me, I realized, was the devastating consequences of allowing the core language of a social movement to be distorted as a means of accruing short-term gain. Consider, for example, words such as "environmental" and "organic." In the beginning, these concepts meant little to most people. Then, countless scientists, educators and activists worked for decades to imbue them with meaning and moral value. Wrapped up in these words were hard-won principles of ecological reality, concern for the common good, respect for our planet, and the timeless wisdom of indigenous peoples. Enter Mark Dowie and the sad story he tells in Losing Ground. Some of the very people who had labored to give the concept of environmentalism so much power, unwittingly played a part in its dilution during what has been called the environmental movement's "third wave." Massive corporate donations, prestigious seats on corporate boards, lunch with powerful legislators, highly publicized "win-win" collaborations with industry — watch as the budgets and membership rolls of environmental organizations skyrocket. It all feels so good and so right. But over time, says Dowie, something subtle starts to shift. Non-profit environmental groups begin to compete more vigorously against each other for press coverage, money and members. Cynicism creeps in. Program priorities inexplicably drift toward those activities which will bring in the greatest financial return. Large organizations start taking credit for the work of smaller ones. At the same time, interest in education and grassroots empowerment falls by the wayside, displaced by a fascination with congressional lobbying and partnerships with industry. Reliable access to national publicity and the corridors of power becomes an end in itself. A grassroots movement morphs into something more businesslike and professionalized, and what were once vibrant gatherings characterized by diversity and passionate dialogue come to resemble the meetings of a trade association or cartel. Every organization must learn how to make more money, how to recruit and retain more members, how to build its advocacy brand, and how to dominate the marketplace of meaning. The idealism of millions of caring citizens is shoveled like coal into the furnaces of never ending corporate growth. Soon enough, a schism opens up between those who enthusiastically collaborate with industry and those who think this way of operating represents an inherent conflict of interest. By and by, a kind of auto-immune disorder sets in, turning people of good will against each other. One camp, filled with righteous indignation, holds faithfully to the "old ways," and battles daily with disempowerment and isolation. Another camp resolutely does what it must to gain a place at the table where the big decisions of society get made, and does their best to resist the creeping temptations of complicity. Before too long, the word "environmental" comes to be applied to the policies of some of the worst polluters, and to a president who has done more to damage the earth than any other in history. In this topsy-turvy scenario, even Monsanto claims to be a green company, presumably run by environmentalists. Meanwhile, as some of the people at the center of the environmental movement become indistinguishable from their former adversaries, others walk away utterly demoralized. Many more just have a feeling of confusion and loss. And the challenges multiply as industry comes up with more and more clever ways to blur the distinction between those who serve the common good and those who serve their own self-interests. As I finished reading Dowie's book, I realized that there is nothing new about all of this. It is a story as old as the hills. Any time we want, we humans can sell what is sacred to us, we can convert things of transcendent moral value into money and the things money buys. 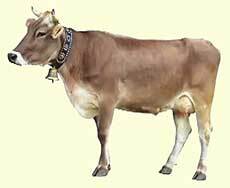 Lead our sacred cow to the auction ring, and with one whack of the gavel, they'll turn her right into a cash cow. But the coins weigh heavily in our pockets, and long after they are spent, we're haunted by the last look in our cow's eyes as she was led away by uncaring strangers into the darkness. So how does this ancient parable apply to the present day? It's all about how the farmed animal issue is being reframed: the only real problem with eating animals, we will tell the public, is the abuse inherent in factory farming. Therefore, the argument runs, the solution is production, distribution and consumption of "happy meat." In this brave new world, a mechanized system designed to move animals quickly and efficiently, to take their lives, to drain their blood, and to cut them into pieces on a scale never before imagined, is proudly described as a "stairway to heaven" by a slaughterhouse designer well on the way to attaining celebrity status. And no one blinks, not even those who hold in their hearts a dream of a world without violence. Such is the hypnotic effect of distorted language and PR razzle dazzle. It is happening now, before our eyes. The moral value of the word "compassion," infused for decades with the altruism and integrity of countless grassroots activists and educators, is in the process of being converted into cash. Compassion will now mean killing more softly, an exciting new brand associated with products delivered with the promise of a precisely regulated and approved amount of suffering. In a time not so long from now, practicing compassion will for many come to mean buying and eating happy meat, a purported win-win-win for the animals, the industry and its customers. And given their track record of deception and an increasingly skeptical public, how will the animal exploiting industries assure their customers that happy meat is indeed truly happy, and that nothing could be more compassionate than buying it? They will create committees, foundations, and blue ribbon commissions charged with developing detailed standards as to how the deed will be done. They will adorn these cross-disciplinary teams with the credibility of people and organizations that have given decades to the cause of freeing animals from exploitation. 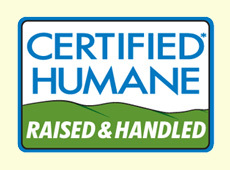 And finally, on the fleshy products that result from this pageantry, they will affix new labels emblazoned with terms such as "Certified Humane," "Animal Compassionate," "Freedom Food," "Animal Friendly," or "Cruelty-Free." By extracting from the public a modest conscience tax in the form of higher prices for goods bearing the requisite label, those who make millions trading in animal parts will watch the price of their corporation's stock rise. 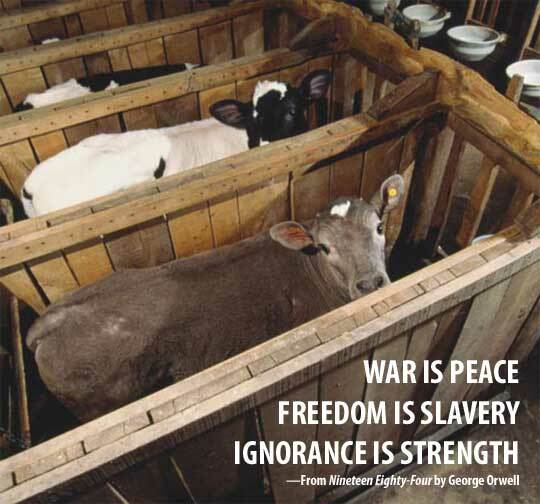 And participating animal advocacy organizations will be sorely tempted to publicly declare victory after victory as each new standard is put in place, reaping copious rewards for seeming to reconcile the inherent contradiction between the enjoyment of flesh and the pain we do-gooders feel over exploitation of the animals. Is this really a breakthrough, or could it be a neo-Orwellian sleight of hand, Doublethink meets Doublefeel? It all sounds so good and so right. But the Orwellian underbelly of Mr. Mackey's world was revealed when an audience member asked him why his company still sells veal, presumably wondering how taking a calf from his mother and butchering him to be packaged and sold in a Whole Foods market could, under any system of rational thought, be fairly characterized as helping that animal achieve an "optimum state of physical and ecological health" or as acting in that individual's "best interests." "If it's a crime to kill an adult cow," Mr. Mackey offered up as a response, "it's a crime to kill a baby calf. I mean, the same argument could be made for lamb or anything else. I mean, Whole Foods is a grocery store, and our customers want to — they want to buy dead animals." So let us call things by their true names. If Mr. Mackey and his Animal Compassion Foundation are going to march under the banner of compassion, let us be clear that it is, as someone wryly noted, a "cutthroat compassion." Given Mr. Mackey's professed education in the field of philosophy, it is hard to believe that the logical absurdities he asks us to accept are the naive errors of an untrained mind. Rather, as a relentlessly successful businessman, he seems to have found a new and creative way to sharpen his competitive edge. "Cause-based marketing" is the method in play, and in this case, success is achieved not by actually practicing compassion toward animals, not by acting in their best interests, but by methodically generating the appearance of doing so, as that is what keeps the customers coming, the protesters at bay, and the stock price climbing ever higher. As another quick-witted observer pointed out, just as the third wave of environmentalism was characterized by "greenwashing," it seems that animal advocacy's third wave is destined to bring us "hogwashing"—the practice of generating the public appearance of having compassion for animals while continuing to kill millions of them for profit. As always, buyer beware. All this said, the humbling truth of the matter is that no one can know for sure which path will lead most quickly to the changes in our society we animal advocates hope for. But by standing by and remaining silent as those who have a financial interest in the exploitation of animals first appropriate and then redefine the very language that expresses the deepest principles that inspire and guide our work, we are surely giving away our power and identity in a way that is going to be very hard to regain. And, as our language loses its integrity, our ability to think critically and to engage in meaningful dialogue is going to decline as well, as will our cohesiveness as a community, our love of the work, and the joy we take from the process of supporting peaceful change. But we don't have to travel any further down this crooked road. There are other choices more direct. 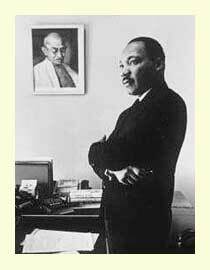 Delving into the lives and work of those such as Gandhi and King, we can see that being practical is not incompatible with being idealistic. Both were constantly faced with pressure to compromise their core principles in return for short-term gains that were desperately needed by those they served. Yet, neither of these brilliant leaders chose to give in to such pressure, nor did remaining true to their principles mean accepting second-class results. Instead, they got outside the box, synthesizing old school values with radical social creativity. They transformed their societies by openly sharing the deepest truth they knew, in the most direct language possible, without compromise, without dilution. And, notably, they avoided conflicts of interest at all costs. Indeed, their staunch refusal to cooperate with or participate in the mechanisms of exploitation provided the very clarity and strength that propelled them to victory. In doing so, Gandhi and King inspired millions to keep their eyes on the prize, not just in their own times, but for all time. Not just for those who shared their causes, but for those who care about any cause. And they did it all with a level of spirited boldness that still takes our breath away. To make good for the long haul, each of us must consider the possibility that our choices, however well motivated, may have unintended consequences none of us desire. Success in the monumental work we have taken on will only come when our vision of a transformed world is brought into harmony with the means we use to make that vision come to life. This is not easy to achieve, but it has been done before, and it can be done again. To do otherwise is to ignore much of what has been learned in the last century about the true nature of the interdependent, interconnected world in which we live. Whether you talk to a historian, a psychologist, a philosopher, or an indigenous elder sitting on a mountaintop, the message is the same. Whatever methods we use to change the world will, in strong measure, come to define the character of who we become, and the nature of the new society we create. It is, essentially, a law of the universe. So let us be open minded, let us engage in spirited debate and dialogue, and together forge strategies of unparalleled creativity and boldness. But at the same time, let us do so in ways that safeguard the integrity of our principles and the language that defines our deepest values. The work of making real change happen is best measured in decades and lifetimes, not in the quarterly cycles of business. Let us not be seduced into believing that the power to mangle language and manipulate perception has anything at all to do with serving the common good. It never has, and it never will. Compassion is the highest expression of human potential. As such, it can never be bought or sold, only freely given and received. Using this word as a label for the products of suffering and exploitation is nothing short of an act of violence. Copyright © 2007 Tribe of Heart Ltd. All rights reserved.